When I look through the Bible and try to see how the Church should be, it is this: a place where disciples of Christ are made, forgiveness is extended and every person is using their God-given gifts to encourage and build others up. Romans 12: 4-8 (NLT) Just as our bodies have many parts and each part has a special function, so it is with Christ’s body. We are many parts of one body, and we all belong to each other. In his grace, God has given us different gifts for doing certain things well. So if God has given you the ability to prophesy, speak out with as much faith as God has given you. If your gift is serving others, serve them well. If you are a teacher, teach well. If your gift is to encourage others, be encouraging. If it is giving, give generously. If God has given you leadership ability, take the responsibility seriously. And if you have a gift for showing kindness to others, do it gladly. Romans 12:4-8 is what happens at Evangel Home. We have those who come to serve (volunteer) and to teach (chapel leaders and classes). Others send encouraging cards to staff and residents and still others give generously. Our board takes their leadership responsibility seriously. Kindness is poured out at our home. Because each of us has chosen to use the gift God has given us, disciples are being made, women are receiving forgiveness and healing from their hurts, and we all get to share in that joy. Just like the angels rejoice over one lost soul coming to God, so we also rejoice when one woman gets to know God’s great love. A resident recently stated that before she came here, she thought people were only evil. Day by day she watched how the staff treated her and how all the people faithfully brought donations and gifts. This young woman was amazed to know that all of these people, who didn’t even know her, loved her. What a joy and pleasure to be one small part of His body! Thank you all for praying as Gerre Brenneman (our past Executive Director) and I have made this transition. I am so excited to be serving with you in this new role! As the end of the year gets closer on the calendar, time on the clock seems to speed up. It has now been slightly more than a year since I began announcing my December retirement. One of the most important things to do at that time was to develop a to-do list of items for the next person – whoever it was going to be. God provided the person – Sarah Dawson – but we still had to make the list. Have you noticed how He does that all the time? He provides what we need, but we still have to get it done! Once Sarah was on board, she, office manager Emily Dull, and I started what we call the Retirement Collection. We all added things to it, and have made sure Sarah is experiencing or doing every item on the list. Currently there are 18 categories covering things such as: social media, annual banquet, meetings, board, staff training, newsletters and thank you letters. Recently Sarah asked me what is the best way for her to meet our donors and friends. We have a mailing list of about 5,500 and a donor base of about 1,000. So meeting everyone is a daunting, if not impossible, task. That is why this letter is so important. It is a real connection between Evangel Home and you. It is a link between our heart and yours, and I have always appreciated that you just want us to be honest. Sarah will continue that same communication, and I hope you will encourage her with notes the way you have done for me. Leadership is a hot topic in our culture. There are thousands of books on the topic (The pages and entries never end if you check Amazon), but the qualities most important for those trying to be godly leaders are top: prayerfully seek God’s direction, be modest, be a peacemaker, be fair and just, surround yourself with honest and trustworthy counselors, be a good learner and listener, be humble, sensible and kind; be slow to anger. Evangel Home is in good hands as we look ahead. As I approach my 30th anniversary as Evangel Home director in May, it is a bittersweet time. I am planning to retire at the end of this year. I’ve always thought that the call from God to retire would be as clear as His call to lead the ministry, and it was. As I prepare for that time, I first want to highlight a few things about Evangel Home. 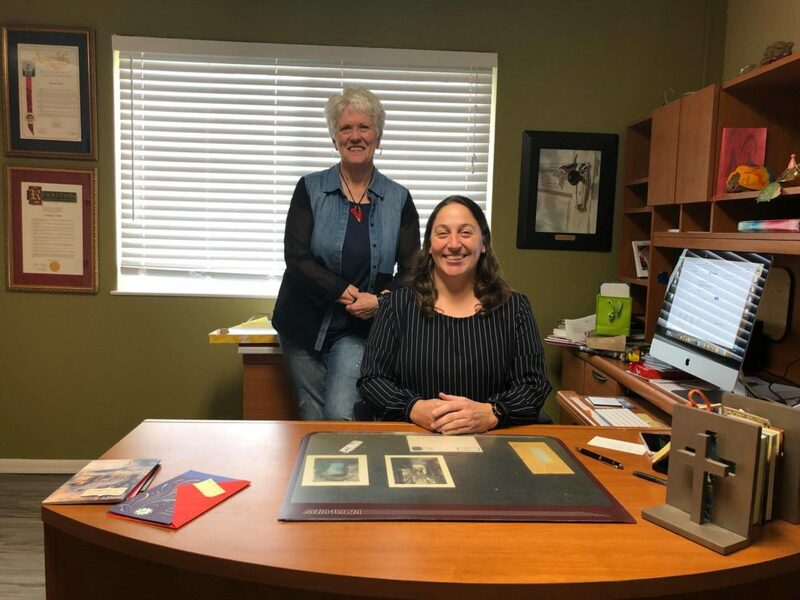 Last fall, staff member Sarah Dawson (with me in the picture to the right) asked what she could learn and how she could prepare to someday be the director. God planted the seed then about the importance for me to train someone to take my place. Sarah is that someone. I met her 20 years ago when she served here as a college intern. 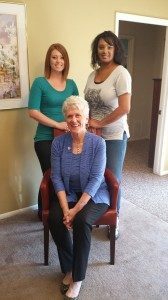 Even though she has had other jobs, she never lost her interest in Evangel Home and always stayed in touch. She currently is our night house manager. She is just as fearful and excited as I was about becoming director in 1988 — feeling inadequate and eager at the same time. But we both know that God is leading us, and we trust Him. Evangel Home is really three things: ministry, small business and family. 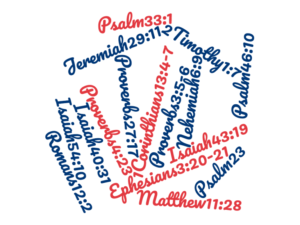 As a Christian ministry, we are dedicated to our motto: Christ Leads, People Care, Lives Change. That remains our commitment, and I pray that people will continue to care, perhaps even more, during this year of transition. There are still precious women coming to us who need the hope of Christ and the support and acceptance they receive at Evangel Home. As a “small business,” we run a tight ship. We will continue to be as transparent with finances, and as open and honest with our decisions, as we always have been. One characteristic of a strong small business is that it is not dependent on one person. When Sarah began to wonder if she could one day be the director, I was excited to begin teaching her. She will take over in 2019, so I still get to write you a few letters! I believe this is one of the most important communication tools we have, and I am confident Sarah will connect with you in her own style. Finally, Evangel Home staff is family, and this is not something I can just walk away from. I will have to figure out ways to stay connected and supportive while allowing new leadership to flourish. I am so thankful that God has allowed me to serve Him, alongside other devoted workers, in a place where we really do make a difference. If I could write a thank you letter that matched the love and encouragement from our friends at this year’s banquet, I would send each of you a bouquet of roses – pink roses. We did send the Evangel Home women who participated in the program flowers, and it’s safe to assume they have not received many bouquets in their lives — just as it is safe to assume they have not experienced the kind of love that filled the room. One was the theme. Yes, “A Night at the Movies” was a bit mysterious, but it worked as a wonderful “wrap around” for the evening. It was more than a theme – it provided atmosphere, action, fun, focus and meaning. Several said they were going to use the idea at their next event. The second thing to be “imitated” was a comment I made on Victoria’s video. Evangel Home is best at “helping one woman 1,000 ways rather than 1,000 women one way.” They have a better chance to be helped when that thought is put into practice. Our women, and others like them, respond best to deep individual attention; attention that can build trust and point to a relationship with Christ. If God knows every hair on their heads, we’d better know their stories and how best to help! 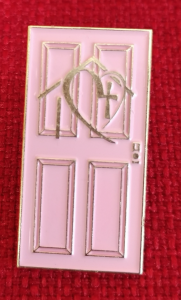 I can’t imagine that there will ever be another gift as meaningful to us as the new pink door pin. Your response to the women giving them to each person was so uplifting to them. One of the women was so nervous that she even asked, “What if someone says they don’t want it?” We assured her that would not happen – everyone would say yes. It was wonderful to see so many people wearing their pins as they left for the evening. It is even more wonderful to know that so many will be praying for us every time you look at that pink door. Thank you. P.S. If you want to see any of the “movies” again, click here to view them on our YouTube channel. I am often asked how people can help us when they can’t give money, don’t have much time, or perhaps are house bound or dealing with their own issues. I often think of a woman who could play the piano but could not leave her house. She would play for people over the phone. The person had no idea I work at Evangel Home, but I loved their question. It’s one I find myself thinking about quite often, and so I was inspired by one person’s answer. 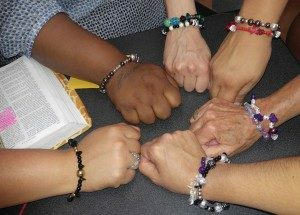 She is making bracelets for “abused and neglected women” and sending them to homes and shelters. So far she has sent her bracelets to Michigan, Maine, Kentucky and now California. Thank you for all that you do to help people. Through the years, I have received a lot of little gifts and a lot or prayer requests. This little angel combines both. I have a number of handwritten prayer requests under my desk blotter from Evangel Home friends who ask that we pray for them. This is where the angel comes in. A woman gave it to me at a church where I was speaking. 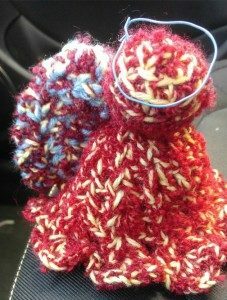 I mentally filed it into my “little gift” category until she told me that she has Alzheimer’s and that making these angels helps her. She also asked for prayer. Paul’s command does not mean we are to be in a head-bowed, eyes-closed posture all day long. He is not referring to non-stop talking, but rather an attitude of God-consciousness and God-surrender that we carry with us all the time. Every waking moment is to be lived in an awareness that God is with us and that He is actively involved and engaged in our thoughts and actions. 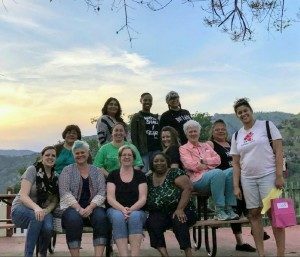 Almost every year since 1990, our staff has gone to St. Anthony in Three Rivers for an overnight retreat – a time always much needed and greatly appreciated. I’ve learned over the years that we do not need a schedule showing us what to do every few hours, but that we need time alone with God and time to be with one another. St Anthony’s is a quick drive, but a world apart. I encourage you to have a little alone time with God and this chapter. Whether you are leading a big corporation, a Sunday school class, young children, adult children, or friends, you are leading and influencing somebody. Are you leading by love? 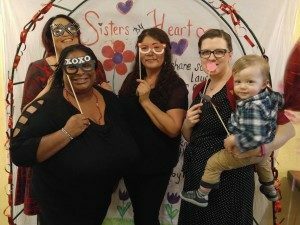 One of our favorite and most significant events of this season is Heart Sisters Week. It began more than 30 years ago when some staff decided that Valentine’s Day should be celebrated first to demonstrate the love of Christ for each of us, and second to celebrate friendship. Even though the activities have changed over the years, the basics are still the same. Staff and program residents exchange little secret pal gifts every day and then we have a “revealing” party and give each other a nice gift. 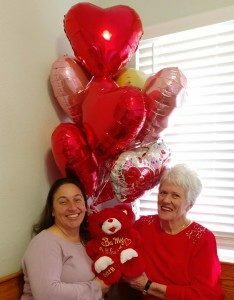 We also include the crisis home women in some things such as our Valentine’s Day luncheon and by giving them a gift each morning on their pillows. Through the years, Heart Sisters has been one of the most powerful and joyful ways to show the love of Christ to our women. It is important for us to be able to provide activities for them that are fun – that is something they have not really known. We are so thankful for our friends who support us and who allow the Lord to touch His chosen in this place called Evangel Home. A special thanks this month for the wonderful friends who helped us close 2016 on a strong note financially. It was a lean year, but giving in December was about $186,000 bringing total 2016 giving to $758,000. It costs about $65,000 a month or $780,000 a year to run the Home, so we will probably dip into savings at some point. HOWEVER, . . . I capitalize that ‘however’ because it indicates the God column on the financial spreadsheet. In nearly 30 years of working with Evangel Home finances, I have learned that just because we can’t count it doesn’t mean we can’t count ON it. God has surprised us in more ways than I can count, and so I believe He will do so this year if we have to cover any gaps. But now we thank Him for the provisions we have, and we thank you for your support and encouragement. As we enter the final two months of the year, our days are paced by what can become rapid-fire activities rather than by meaningful acts. I would encourage you to pamper yourself a bit during this season to make sure you stay physically healthy, to ask God to give you an experience outside of your traditions or your comfort zone, and to listen for Him in the midst of all the noise. That thought was delivered to me last month through a very unlikely source: donuts and neighbors. I had purchased a box of Krispy Kreme donuts for a fund raiser and decided I would give it to the first person I saw when I left work. As I drove to the end of the alley I saw 4 people — 3 black, 1 white. The white person was the oldest; in a wheelchair, wearing some sort of beach umbrella hat, and I could not tell if the person was a man or woman. A second person seated in a wheelchair was a very thin woman wearing a wig, hooked up to an oxygen tank and drinking a beer. There was a handsome young man talking to them, and a little boy about 3 in the middle of it all. 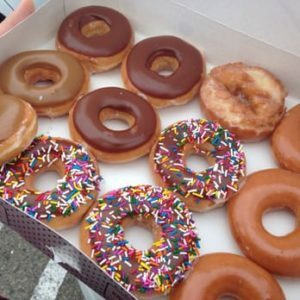 OK, there was my donut group. Many of you will do similar things this time of year: distribute food to strangers, buy gifts for people you hardly know, make sandwiches to give to hungry people. What if God is using those acts to speak to you – even more so than to the people you are helping? Listen for Him. Thanksgiving and Christmas might be days that come once a year, but to Christ followers they should be year-round. They should mark the conditions or our hearts, not the calendars of our events. 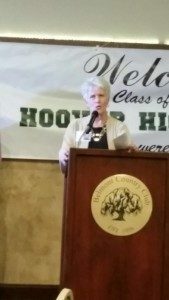 In September I attended my 50th high school reunion – Hoover High Class of ’66. It’s difficult to share memories without revealing age, so I jumped over that hurdle a long time ago. I suppose every class thinks it’s special, but the 1966 Patriots’ class really does own several distinctions. We attended a brand new school, and we were the first class to enter as sophomores. The entire student body was less than 900 and our class was about 375. We had excellent teachers who were chosen to get the new school up and running. We did not win a single football game the first two years but we won the league championship in 1966. We still talk about that season. We have lost about 50 classmates (that we know of) – a number which seems more than our fair share, but this was just prior to drugs becoming a problem, Viet Nam was calling and claiming some, and we ARE getting older. We were raised by the Greatest Generation and yet embraced much of the Counter Culture – childhood and young adult markers for those of us known forever as the Baby Boomers. Many in my class are successful, many are still married to their high school sweethearts, many are believers, and many are very generous. So I got to stand in front of those people I’ve known (and some I’ve not known) for 50+ years and speak briefly about Evangel Home. I was privileged to share my life’s work because of their generosity. 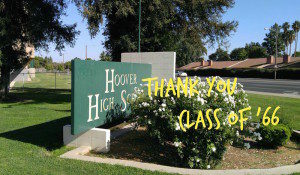 Those high school roots are anchored firm in fellowship and have grown into dedication to Christ for many of us. Thank you for being part of that root system. One of our staff members recently gave me a great gift — a chubby little gold hedgehog wearing a pink party hat. Perfect. The Hedgehog Concept looks at 3 questions: What are you most passionate about? What can you be best in the world at? What drives your economic engine? We worked on those questions for weeks, and even though are answers might be different today than 10 or 15 years ago, the Hedgehog Concept resulted in our motto: Christ Leads, People Care, Lives Change. Everything we do should fit into one of those phrases. And the hedgehog? He reminds us to keep focused, keep doing what we do best, don’t worry about what others are doing, and then start all over again tomorrow. 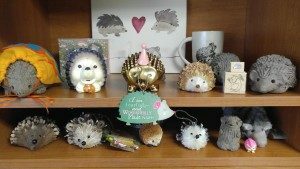 Every staff member has a Margaret Hudson clay hedgehog. Sometimes we will get distracted and one of us will just say “hedgehog.” Remember why we are here. I recently gave a report to our board of directors on the many facets of Evangel Home, and how I see things at this point. 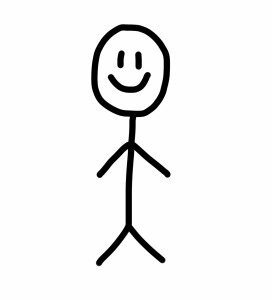 I used sort of a stick figure example to provide an evaluation, and thought it would be good to share the results with you. HEART = Christ. Outward signs of worship might change through the years, but Christ was and must always be first here. “Christ Leads, People Care, Lives Change.” Those six words are not only our motto, they are the foundation of ministry and the blueprint for all we do. BACKBONE = Staff. We have a staff of 20 full and part-time dedicated servants including two professional counselors. Among full-time staff, the average tenure is 10.7 years. That is testimony to the dedication and quality of our people. The work is hard, and the pay is low, but none of us want to be anywhere else. ARMS = Program and Counseling. The key here is to provide a balance of self-awareness and relevant classes, Bible study, fitness and counseling. Our women and children face different challenges than they did in earlier years. Therefore, we need to be flexible enough to keep up with change, but firm enough to not bend on the basics. HANDS = Volunteers. The time and type of service that people want to give has changed, but volunteers are still crucial in shaping our property, programs and people. LEGS = Donors/Churches. Our donor base and budget are stable, but we will need to increase both in the future in order to keep up with things like increased minimum wage. MUSCLE = Board. It is the muscle system that provides strength, motion, movement, tone and flexibility. It is unseen but essential to the health of the whole body. BRAIN = Things to think about. There is plenty to think about, but I believe that as we face things, we do so head on; we pray always; we pivot when necessary; and we never allow the pursuit of money to set our vision. We ask only two questions in all that we do: (1) How is God honored? (2) How does it help our women and children? Thank you for the part you play in keeping us healthy and vibrant. One of the things I am blessed with at Evangel Home is the opportunity to meet people like Nadine. She is not homeless, doesn’t live far from us, and says she enjoys looking for treasures. Today one of her treasures is this set of reindeer antlers that we had discarded. 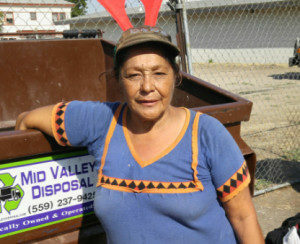 We try to leave things by our dumpsters that can be used, and we give food and water when we can. And you just never know when someone might be given a little boost by finding antlers in September. We try to be a light in the alley as well as in the home, and through the years have come to know people like Nadine, Moses, Danny, Famous, Betty, Anthi, Mary, John Doe, and the list goes on. These were all people we were able to serve through the back door. They were not all pleasant nor easy to be with, but as long as they weren’t dangerous we tried to help. Anthi and Mary eventually DID come through the front door! When Mary was still “treasure hunting” I gave her some candy, and that turned out to be an invitation to come into the home. 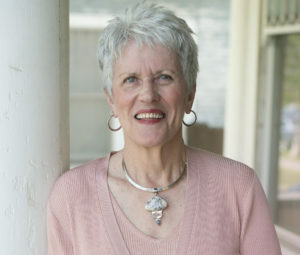 Eventually she did, and after years of trying, of being in other places as well, she is a rock solid Christian woman, with a job and supportive family. 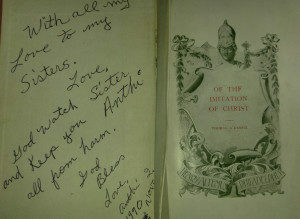 Anthi later told me she chose the book for us because we could sell it for “lots” of money if we ever got in trouble. The book stays on my desk as a reminder of what it means to imitate Christ, and I’m very thankful we’ve never needed to sell the book. Several years ago staff tried to summarize our ministry in as few words as possible and came up with these six words: Christ Leads, People Care, Lives Change. Those 3 phrases became our motto several years ago, but more than that, they are words to live by. You, our supporters, are literally the link between Christ and changed lives. We are fortunate to see the results of your caring commitment every day and as we enter the last weeks of 2014, we are praying to close strong financially, spiritually, and relationally. It is our prayer that those Changed Lives, having received new life in Christ, will one day share in the blessing of standing with those People who Care and make all the difference. Yes you do! You, our supporters, are renovating an apartment and leading chapel; organizing the donations in the basement and answering phones; serving on the board and giving financially … The list also includes you helping our Kid Zone becoming a reality. We have hired a second teacher, staff has come up with a model, and we are off and running! Also, your generous outpouring of funds at our banquet in 2014 helped our ministry tremendously. We raised $50,000. We’ve even given people like you, are supporters, a special name — The Home Team. You give us the Home Team advantage, are always there for us, and cheer for our women and children in a way that helps them. Thank you, Home Team! Gina: Gina Walker graduated in 2010, joined our staff as a house manager in 2012 and this year qualified to become one of our parenting teachers. 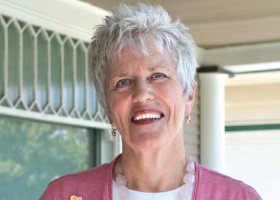 Gina brings a sense of joy and a call to accountability for the women she supervises and teaches. She has been where many of them are right now and is able to connect with them on that level, but more important to inspire them to step up to another level. She is living proof of a life changed through Christ, and it was her faith in Him that pulled her through a tragic time last year when she lost her son, Jerome. Gina and her husband, Derrick, are now raising Jerome’s children. There is no quit in Gina. There is only Christ. Kelly: “My mom’s name is on the wall!” These were the proud words of 5-year old Addison for something her mother, Kelly, accomplished before this little one was even born. When stopping by the Home recently, Kelly showed Addison the 2002 grads and pointed out that her name plaque was the first one that year. Addison was as excited for her mom at that moment as we were in 2002. Judy: We love it when grads and former residents drop by for a visit. We are really glad Judy paid a visit because we discovered that her graduation name plaque was in the wrong year, so we moved it to 1999 where it belongs. It is especially touching and encouraging to staff and current residents that these name plaques are so important. Judy is doing well and works as an office manager in a medical office. We recently had something minor happen that offered a major illustration of God at work even when we don’t see what He is doing; even when it might not feel good. The old wooden sign that has hung on the post in front of our property simply says, “EVANGEL HOME 137.” It was splintered and weather beaten, but it still identified us and welcomed people here; something it has done for decades. Then several weeks ago it disappeared. I had no idea what happened, and was suddenly and profoundly saddened by the empty space — not just the absence of the sign, but the fear of what would happen in the absence of our ministry. The old wooden sign is in a way a symbol of what women and children can find in this place. You give life to that symbol by being the hands, feet, and heart of Christ. I thought about the disappearing ministry because of last year’s disappointing finances. Evangel Home has a financial need, and I am asking for your help to meet it. Year-end giving was not as significant as it usually is. In fact we experienced the fourth lowest December giving in 15 years — coming at the end of a year that was already down. Now, we have very little in reserve. We were able to reduce expenses from $732,000 to $717,000 in 2013 and relied on the 2012 financial cushion to get us through last year. That cushion is now threadbare. Many of our donors have remained steadfast and committed during these unsettled economic times, but some have had to reduce the amount of giving. Compounding this is the loss of several large and long-time annual gifts. We lost $30,000 in this area. Back to the sign for a minute. I soon learned it had not been stolen, and even though it has now been returned, it is not perfect. A friend named Rod had taken it to freshen it up, and he planned to make it better than ever. However, as he sanded, puttied, painted, and varnished, he suddenly envisioned the sign as an example of what God does as He welcomes women and children to this place. So Rod left some splintered wood and unfilled cracks; some dull paint and rough spots to remind us of the women who still need to come to Evangel Home and let God put them together. Just as our friend had a surprise plan for the sign, we believe that God’s plan for Evangel Home is a similar story. We do not always know what He is doing, but we do know that He is always faithful. We will never be perfect, but we pray that Evangel Home will continue to welcome women and children, in His name, for decades to come. Many women have said they find Christ in this “place of love and restoration.” Please consider helping us through this rough financial time and ensure that such discovery is possible for those women and children yet to come. The women of Evangel Home are like pebbles landing in water and sending out ripples that affect their futures, their relationships with God, and the lives of their friends and families.You are also like pebbles, but rather than being the ones who land, you are the ones creating ripples that touch the lives of our women and children, hold up our ministry, and affect a neighborhood as well as a Kingdom. If Evangel Home is a body of water, the ripples of financial support are pretty calm in this season. 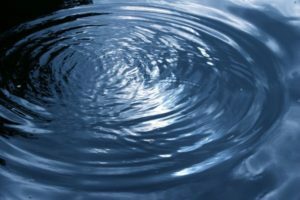 Comparing ripples to ripples, we are down 15 percent from this time last year. It is encouraging to know that giving in the last quarter of the year usually picks up and carries us into the next year. 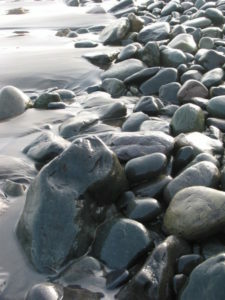 However, we do see some warning signs on the water and are asking more people to serve as those ripple-creating pebbles. In addition to trusting that some will read these words and respond here, we have also created a special Team Evangel area on our website with some opportunities for consistent support. Visit us at www.evangelhome.org/teamevangel.